This is one of the best known views of Rome, but Giuseppe Vasi was not the first one to depict it; Gaspar Van Wittel (1653-1736), a Dutch landscape painter who spent most of his life in Rome painted this view of the Tiber in the 1690s (you may wish to see it in an external link). Vasi chose a point of observation closer to Ponte S. Angelo than Van Wittel and his etching provides a more detailed view of Piazza di Ponte, the square which was located at the beginning of the bridge; Vasi shows to the far left Cappella della Conforteria where (up to the XIXth century) those sentenced to death were comforted prior to the execution which took place in a corner of Piazza di Ponte; the chapel was dedicated to S. Giovanni Decollato and it belonged to Arciconfraternita della Misericordia, a brotherhood of the Florentine Community in Rome (which also had a church in Velabro). The view is taken from the green dot in the small 1748 map here below. 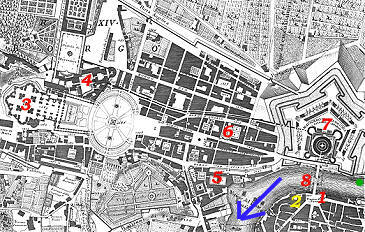 In the description below the plate Vasi made reference to: 1) Cappella della Conforteria; 2) Palazzo Altoviti; 3) Basilica Vaticana; 4) Palazzo Pontificio (left) and Palazzo del Belvedere (right); 5) Spedale di S. Spirito; 6) S. Maria della Traspontina; 7) Castel Sant'Angelo. 3), 4), 5), and 6) are shown in other pages. 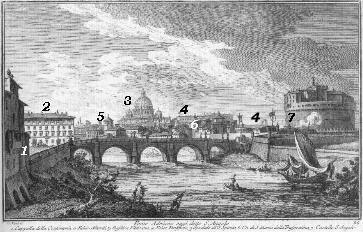 The small map shows also 8) Ponte Adriano or S. Angelo. Vasi showed Castel Sant'Angelo also in plate 20 and in the related page you can find more information on its fortifications. 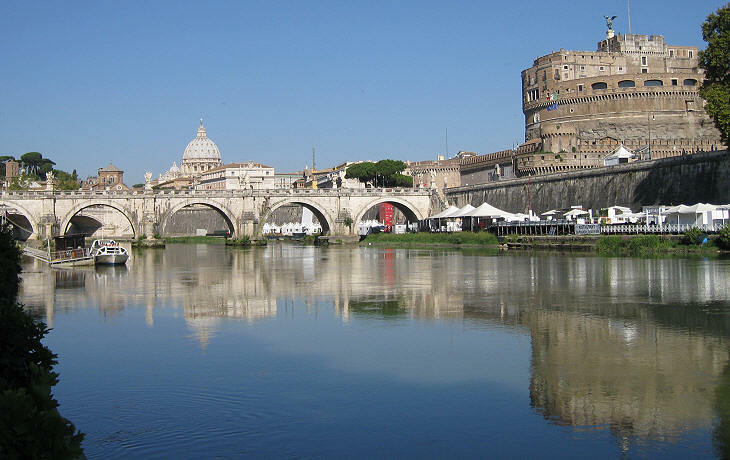 In the late XIXth century the river bed was enlarged and high walls were built on its banks in order to prevent floods; the small arches at both ends of Ponte S. Angelo were replaced by two arches of the same size as the central ones. These changes impacted on Piazza di Ponte which was significantly reduced with the loss of Palazzo Altoviti and Cappella della Conforteria. The front of Castel Sant'Angelo was modified by relocating its XVIIth century entrance to a side wall of the building and by pulling down a XVIth century bastion to show a tower built at the time of Pope Nicholas V.
The ancient name of the bridge was Pons Aelius; it was built almost exclusively to allow access to the mausoleum of Emperor Hadrian and to facilitate its construction; as a matter of fact it became the most important bridge of medieval Rome because the majority of the other bridges collapsed. 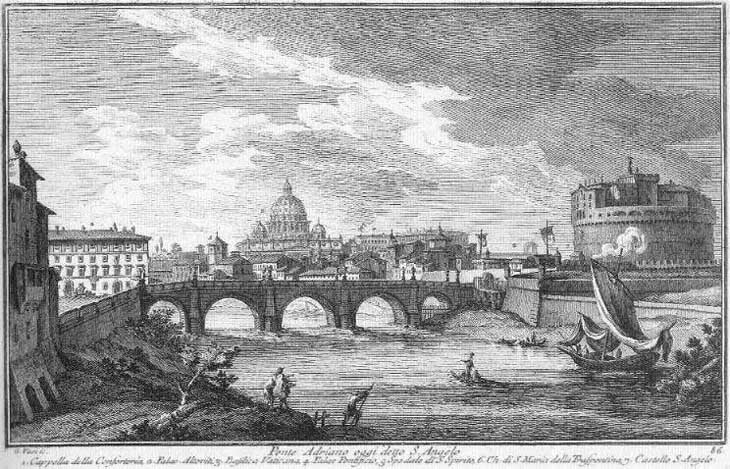 In a page dealing with another plate by Giuseppe Vasi showing this bridge you can find a more detailed description of Ponte S. Angelo and its statues. The behaviour of Emperor Hadrian was a subject of controversy during his lifetime and after his death; the imposing mausoleum he built on the right bank of the river was at risk of not being completed because of the opposition of the Senate, but Emperor Antoninus Pius, his successor, insisted on its completion and wanted to be buried there, thus turning the building into the funerary monuments of the emperors (Caracalla was the last emperor whose ashes were placed inside the mausoleum). The mausoleum consisted or a circular tower on a square base; on the roof of the tower there was a mound having at its top a circular temple; a statue of the emperor driving a quadriga, a chariot drawn by four horses, was placed at the top of the temple; there is a possibility that the horses which today are in Venice were in origin part of Hadrian's quadriga; the emperor was portrayed as Helios, the Greek god of the sun; Hadrian belonged to gens Aelia and his second name was Aelius which sounds very similar to Helios. The structure of the building was made up of opus caementicium (see a page dealing with Construction Techniques in Ancient Rome) and it was faced with travertine and tufa. 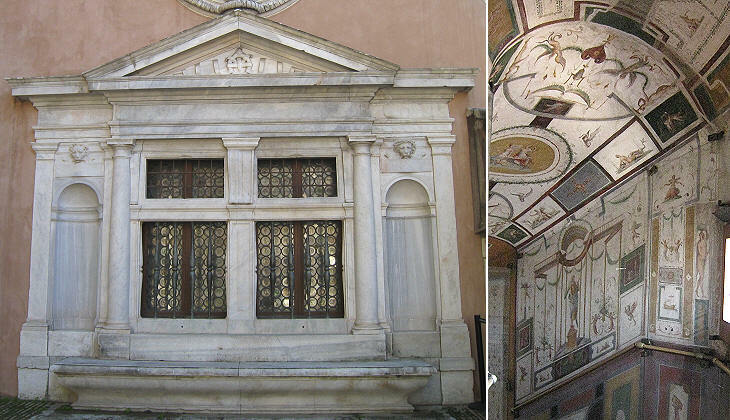 It had an elaborate marble decoration and many statues were placed on the balustrade of the roof. The top of the building was accessed through an internal circular ramp which allowed the passage of carriages. The mausoleum was perhaps sketched by the emperor himself and it was built by the architect Demetrianus. On a day of winter 590 St Gregory the Great was leading Litania Septiformis, seven processions which started from different churches; they all went towards S. Maria Maggiore and from there to S. Pietro; the objective of the procession was to pray for the cessation of a plague; when the pope was about to cross the bridge in front of the mausoleum he saw Saint Michael the Archangel on top of the building in the act of sheathing his sword: this was interpreted as a sign of the end of the pestilence, which actually ended soon afterwards; the miraculous event changed the name of the mausoleum and of the bridge. The utilization of the former mausoleum as a fortified site began during the VIth century Greek-Gothic War; in the IXth century Pope Leo IV linked Castel Sant'Angelo with walls to S. Pietro; later on these walls became known as il Passetto (the small passage) because they allowed the popes to seek refuge in the castle. The popes however were unable to retain control over Castel Sant'Angelo which became a stronghold of the Crescenzi and of the Orsini. 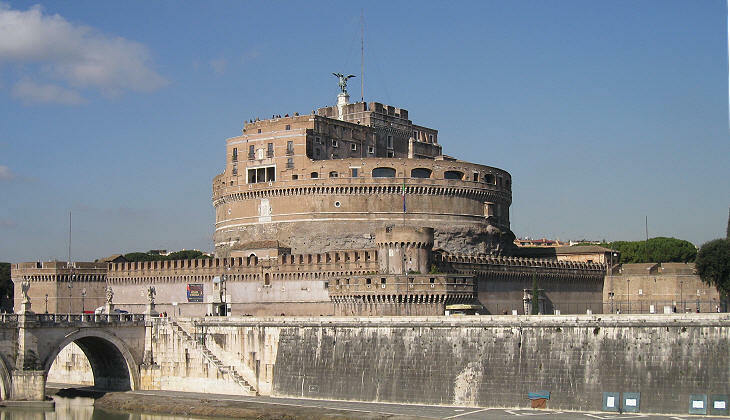 The popes regained control over Castel Sant'Angelo after their return from Avignon and Pope Boniface IX cleared the central tower from the rubble it was surrounded by and fortified the square base; he also built a new internal ramp which was more easily defensible, owing to its traps. Pope Nicholas V built small towers on the walls along the river. Pope Alexander VI promoted a major restructuring of Castel Sant'Angelo by building bastions at each corner of the base, by providing the central tower with battlements, by building warehouses to store supplies and by initiating the development of a papal apartment. Pope Julius II, Pope Leo X and Pope Clement VII were mainly involved in enlarging the papal apartment; during the 1527 Sack of Rome, Pope Clement VII lived for a month in that apartment; his successor Pope Paul III greatly strengthened the fortifications of Rome, but not those of Castel Sant'Angelo where he focused on the decoration of the papal apartment; Perin Del Vaga, a scholar of Raphael, painted a large hall (Sala Paolina) with events of the life of Alexander the Great (the pope's name was Alessandro Farnese) and with a portrait of Emperor Hadrian. 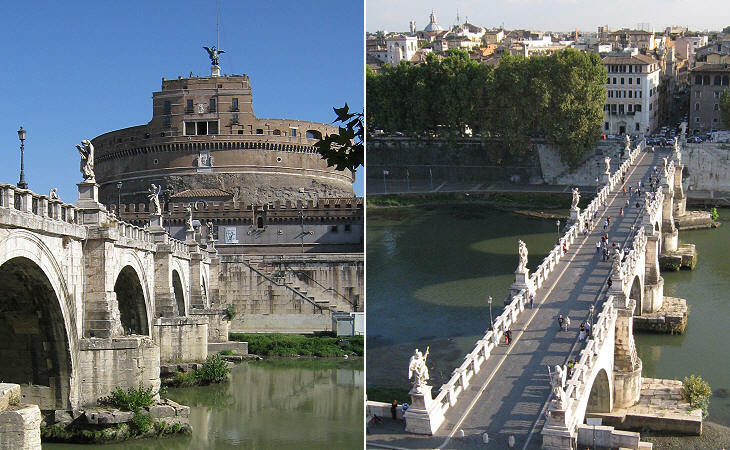 Today Castel Sant'Angelo is a National Museum, where one can admire its extraordinary artistic and historic heritage. 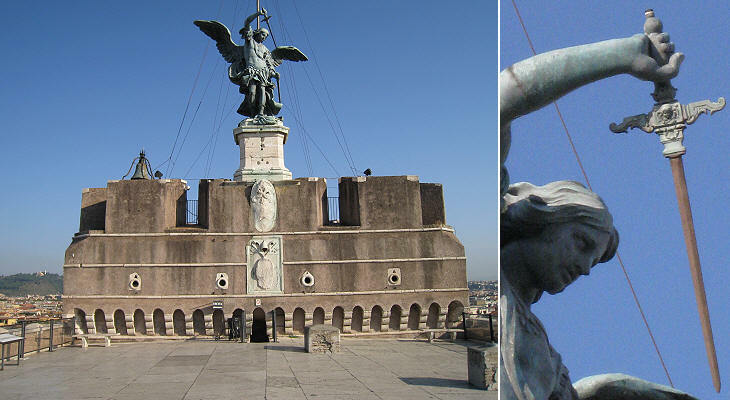 Dan Brown set an episode of his novel Angels and Demons in Castel Sant'Angelo; read some remarks on it. 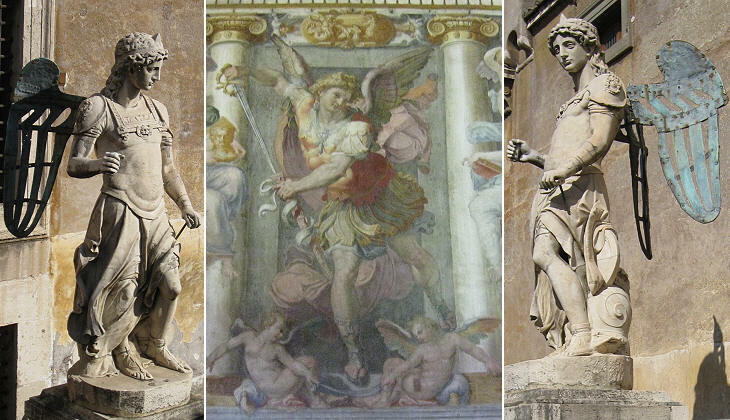 In 1752 a bronze angel by the Flemish sculptor Peter van Verschaffelt replaced a marble statue by Raffaello da Montelupo at the top of Castel Sant'Angelo. The statue by Verschaffelt was composed of 35 bronze pieces and its structure was strengthened by three iron bars inside the bronze shell. The two angels could not have been portrayed in a more different way; the design of the bronze statue was influenced by a famous painting by Guido Reni, while the angel by Raffaello da Montelupo has the composure of an ancient warrior in a moment of rest. Angels sheathing their swords to indicate the end of a pestilence can be seen in Vienna. 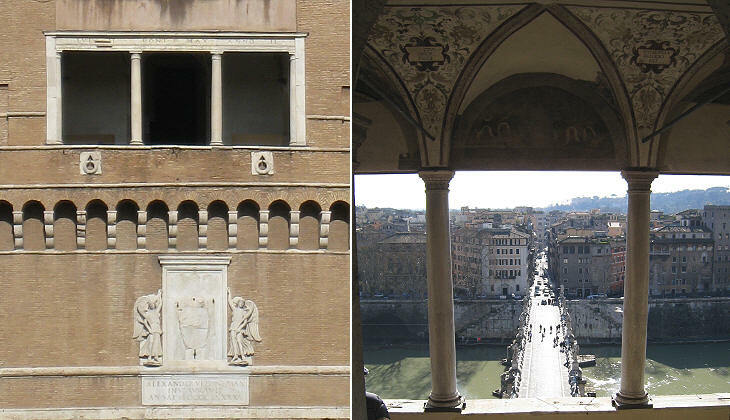 The terrace offers a fine eastward view over some monuments of Rome. 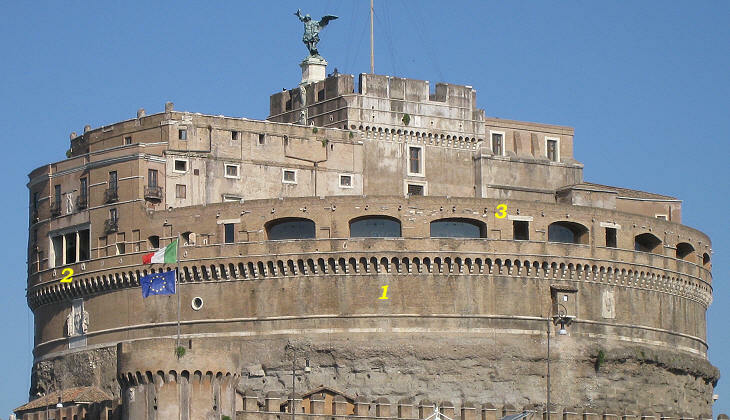 You may wish to click on the image below and jump to some of the buildings marked with a number in the image further down or you may wish to see a page with larger views of Rome from Castel Sant'Angelo. According to tradition in 1481 Pope Sixtus IV celebrated the tenth anniversary of his election with a firework display from Castel Sant'Angelo; until 1851 the fireworks at Castel Sant'Angelo were one of the main attractions of Rome; Michelangelo and Bernini designed temporary structures for enhancing their effect; the display ended with la Girandola, a major launching of rockets from the top terrace. 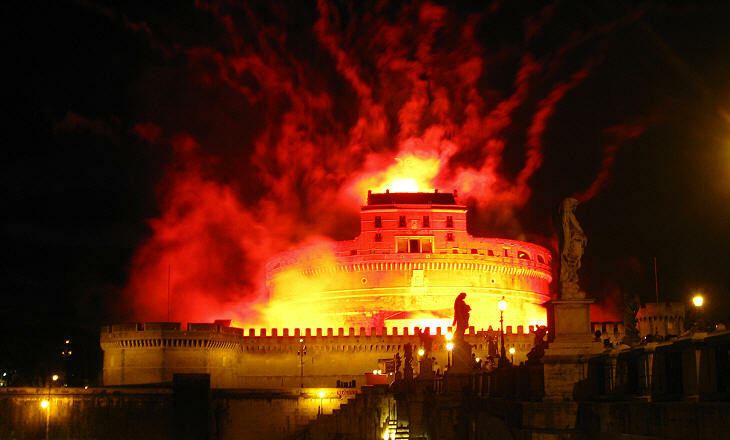 Read Charles Dickens's account of the fireworks at Castel Sant'Angelo in 1845 or see an entire page on the re-enactement of the fireworks. 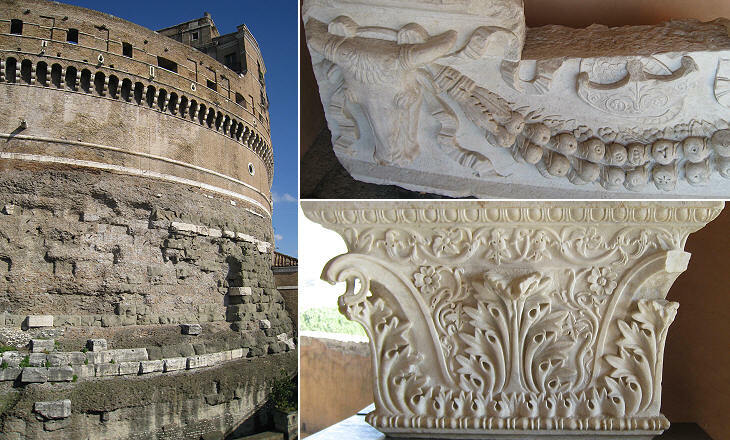 Castel s. Angelo Questo rotondo e maraviglioso masso, che ora vediamo spogliato di ogni ornamento, fu edificato, come dicemmo, dal suddetto Elio Adriano Imperatore ad imitazione del Mausoleo di Augusto, per collocarvi le sue ceneri, e seppellirvi i Cesari suoi successori, giacché quello era già pieno, ne' più vi si sotterrava alcuno. Era questo tutto ricoperto di marmo pario, e circondato di maravigliose colonne, colle quali Costantino Magno ornò poi la basilica di s. Pietro, e quella di s. Paolo, nella quale ancor si vedono con ammirazione. 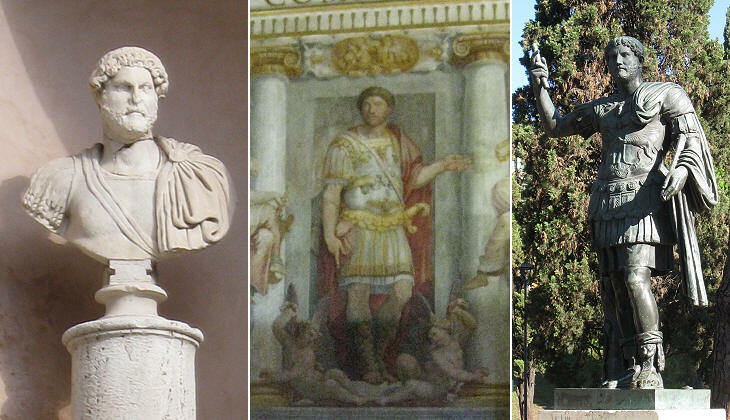 Eranvi ancora delle statue di marmo e di metallo, con carri, cavalli, e quadrighe, e furono in tanta copia, che di sepolcro ridotta poi in fortezza in tempo di Belisario, e di Narsete, le gettavano per difendersi da' nemici. Le ceneri di Adriano furono le prime, che si ponessero nel più alto, ed eminente luogo di questo Mausoleo, entro una gran pina di metallo corintio; dipoi vi furono riposte le ceneri di tutti gli Antonini, che seguirono dopo di lui. Ma dopo, come dicemmo, essendo mutato in fortezza, o castello mutò anche nome nel Pontificato di s. Gregorio Magno: poiché nell'anno 593. essendo Roma afflitta colla peste, e rivoltato il santo Pontefice a placare l'ira di Dio colla penitenza, mentre processionalmente portava l'immagine della ss. Vergine nel giorno di Pasqua di Resurrezione, all' avvicinarsi a questa mole, sentissi una voce invisibile, che disse Regina Cali latare, alleluja, a cui il santo Pontefice attonito rispondendo con viva fede, Ora pro nobis Deum, alleluja, il Signore si compiacque, che da quel punto principiasse a cessare la mortalità, e però in memoria, ed allusione di ciò fu posta sulla cima di quella mole; un Angelo in atto di riporre la spada nel fodero; e dal medesimo Pontefice fu eretta una chiesa in onore del celeste Principe s. Michele Arcangelo, non già quella, che sta su questa mole, ma quella, che fra poco vedremo presso la medesima mole; imperciocchè si crede universalmente, che poi da Bonifazio III. o IV. sia stata eretta questa, che per la sua alta situazione fu detta inter nubes; ed il castello si dice s. Angelo. Si disse similmente rocca o torre di Crescenzio, perchè da un tale Nomentano fu occupata l'anno 985. ma essendo poi scacciato da Ottone III . fu ridotta da' Pontefici in forma di cittadella, ed ornata di varie particolarità. Urbano VIII. la guarnì di cannoni, e mortari fatti col metallo del Panteon. Fra le rarità, che vi sono, si annovera una loggia con stucchi di Raffaello da Montelupo, e con pitture del Sermoneta, una sala dipinta da Pierin del Vaga, con pavimento di pietre vaghissime, altre stanze dipinte dal medesimo Pierino, da Giulio Romano, e da altri, con alcuni busti antichi. Evvi ancora una copiosa armeria, un archivio segreto, in cui si custodiscono gli originali di alcune bolle Pontificie, e gli atti de' Concilj, con altri manoscritti di grande stima. Benedetto XIV. vi fece l'orologio sul prospetto, e la statua di metallo sulla cima, cavata dal modello di un Francese.